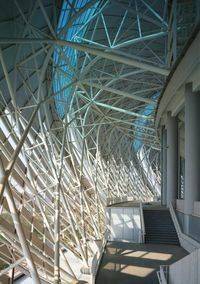 The design for Nanchang’s largest new sports complex was commissioned back in 2007. On the surface of 62 hectares, in a newly-created district along the Gan River, a new multi-sport stadium, indoor hall, swimming arena and tennis arena were built. Initially planned to host the 7th edition of Intercity Games, the stadium received significant use also after the tournament. Opened in 2011, the venue has dynamic architecture with external wrap imitating a vortex pattern. 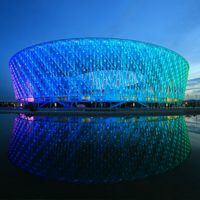 The colours are rather cold and sober with only one vivd accent – the additional inner ring of the roof made with red steel and carrying the floodlights. Stands accommodate some 58,000 people on three tiers.